Until the Rulers Obey brings together voices from the movements behind the wave of change that swept Latin America at the turn of the twenty-first century. These movements have galvanized long-silent—or silenced—sectors of society: indigenous people, campesinos, students, the LGBT community, the unemployed, and all those left out of the promised utopia of a globalized economy. They have deployed a wide range of strategies and actions, sometimes building schools or clinics, sometimes occupying factories or fields, sometimes building and occupying political parties to take the reins of the state, and sometimes resisting government policies in order to protect their newfound power in community.This unique collection of interviews features five dozen leaders and grassroots activists from fifteen countries presenting their work and debating pressing questions of power, organizational forms, and relations with the state. They have mobilized on a wide range of issues: fighting against mines and agribusiness and for living space, rural and urban; for social space won through recognition of language, culture, and equal participation; for community and environmental survival. The book is organized in chapters by country with each chapter introduced by a solidarity activist, writer, or academic with deep knowledge of the place. This indispensable compilation of primary source material gives participants, students, and observers of social movements a chance to learn from their experience. This is the book we’ve been waiting for. Anyone interested in the explosion of social movements in Latin America – and the complex interplay between those forces and the “Pink Tide” governments – should inhale this book immediately. Until the Rulers Obey gives us country-specific context from a superb team of “introducers”, who then step aside so we can hear a chorus of voices from some of the most inspiring grassroots organizations on the continent. This is a people’s history in real time, bubbling up from below. A new world is dawning in Latin America from the bottom up. This book brings an all-star cast of scholar-activists together with social movement and community leaders from throughout the region. The reader will hear the clarion call for social justice from those who are on the front lines of grassroots resistance and popular struggles in this age of globalization, crisis, and transformation. These are the voices that too often are suppressed by the powerful and the means of communication they control. I cannot imagine a more important and timely volume for scholars and activists who wish to understand the transformations that are sweeping the sub-continent. Until the Rulers Obey is a profoundly necessary book. Little has been published about Latin America in the way of an overview from 1989 to the present, even less in the voices of the protagonists themselves. The great experiments of the 1960s, ’70s, and ’80s failed, but new and in many cases less dogmatic approaches to social justice have taken root in a number of countries south of the border. This book explores those efforts, often in the words of the change-makers themselves. Clifton Ross and Marcy Rein have done us a great service. Read this book for access to what the U.S. corporate media still doesn’t want us to know. Latin America is the last region in the world that still has a vibrant Enlightenment left, which sets both the practical agenda in terms of policy and the horizon in terms of utopia. This wonderful edited collection of analysis and first-person accounts by Clifton Ross and Marcy Rein, Until the Rulers Obey: Voices from Latin American Social Movements, shows why. It assembles people who are both activists and analysts, who see no difference between interpreting and changing the world. It deserves a wide audience. 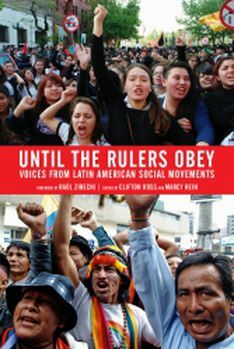 Until the Rulers Obey is the most exhaustive and comprehensive work of primary source material from social movements in Latin America to appear in English, presenting the testimony of the brave women and men who have challenged the old leaders, and are serving notice on the new aspirants to power that they can only rule legitimately if they listen to the voices and demands of the people. In addition to providing a report on the current state of popular struggles, this anthology compiled by Clifton Ross and Marcy Rein will also serve as a compendium for future writers and historians who want to understand the social movements that transformed Latin America during the early years of the new millennium.